The Snowy Mountains of south-eastern New South Wales, extending south to the Victorian border, are rich in fly fishing history. 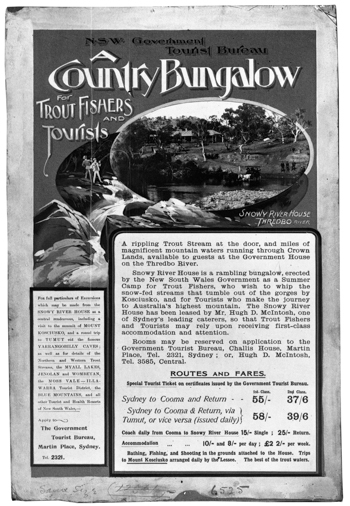 They are still mainland Australia’s premier trout fishery. To the east, the fertile slower streams of the Monaro tableland also provided world class fly fishing. It was haunted by the shades of mighty fishermen of the past, who rode in with pack-horses and camped by far pools of the Snowy when fishing was really fishing; and it was patrolled still by a few survivors of the heroic days and by their direct heirs and descendants, tall, silent, formidable men who trod the veranda in big boots and disappeared early in the morning. From 1949 to 1974 the giant Snowy Mountains Scheme brought huge changes. Favourite stretches of rivers were dammed, once isolated streams became easily accessible, and the legendary Creel was submerged by the new Lake Jindabyne. Some of the 16 major new dams, notably Lake Eucumbene with its 250 km shoreline, provided anglers with many new opportunities and led to innovations in tackle and techniques. However, the once mighty Snowy River was reduced to one per cent of its natural flow below Lake Jindabyne.